Turkish police have thwarted an attempt by LGBT activists to hold a pride march in İstanbul’s famed Taksim square to mark one of the largest organized gay festivals in Turkey. According to Turkish media outlets and several pro-LGBT twitter accounts, police fired plastic bullets at a group of around 40 activists in the country’s largest city. The BBC’s Mark Lowen also said that the heavy police presence stopped people from entering Istiklal street, where the rally was scheduled to start. According to the Hürriyet daily, at least 10 people have so far been detained and among them was Bram Janssen, an AP reporter covering the attempted march. On Saturday, the İstanbul Governor’s Office banned an LGBTI pride parade scheduled to take place in Taksim on June 25, citing security and public order concerns. The organizing committee for LGBTI pride week reacted to the decision of the Istanbul Governor’s Office, saying banning the march contravenes international conventions, Turkish law and the constitution. Last Monday, the Alperen Ocakları, an offshoot of Turkish nationalist movement the Grey Wolves (Ülkü Ocakları), announced that they would not allow LGBTI members to hold a pride parade on June 25. A group of NGOs announced on Wednesday that they planned to file a criminal complaint against the head of the nationalist Alperen Ocakları’s İstanbul branch over his statement. 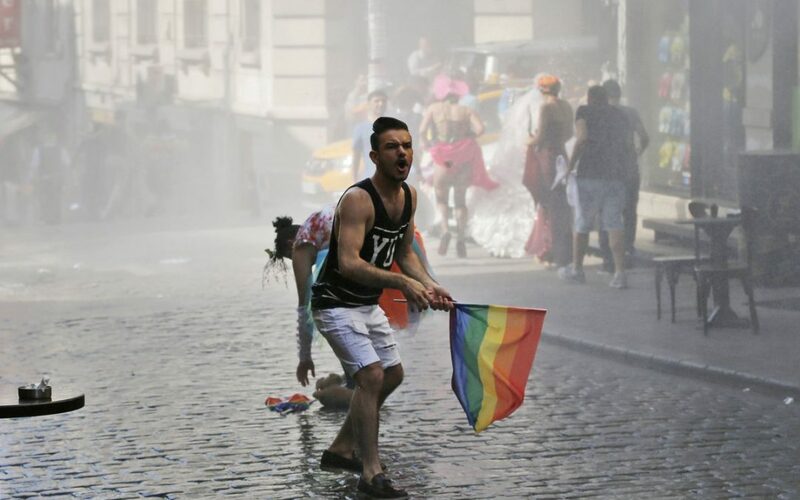 Last year, the İstanbul Governor’s Office banned a pre-scheduled LGBTI pride parade to take place in Taksim on June 19 and 26, after an attack at an Orlando gay nightclub, where a gunman killed 49 people and injured more than 50.